Overcrowding on commuter trains to and from London declined slightly last year - but increased on routes into other major cities in England and Wales. 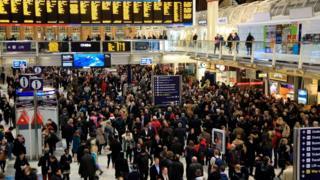 The Department for Transport said nearly a quarter of all passengers had to stand on trains into the capital. Meanwhile, significant numbers were also unable to find a seat on services into Manchester, Birmingham and Leeds. The fall in overcrowding on services into and out of London reflected a decline in overall passenger numbers. The decline in passengers was particularly noticeable in the South East, but outside London there was an increase in numbers. However, the capital still had the highest proportion of overcrowded services, followed by Cambridge and Manchester. Transport Secretary Chris Grayling said the network was overcrowded, but that the government was investing more money than at any time since the steam age in expanding capacity. More than one million passengers arrived into London on a typical day. Some 55% of those passengers arrived in the morning peak period, which is defined as services arriving at a city centre in a three-hour period from 7am to 10am. King's Cross had the highest overcrowding rates in the morning (9%) and afternoon peaks (5.6%) of all the central London stations during 2017. In the 2017 morning peak, 23% of passengers were standing on trains arriving into London, and for those arriving into Blackfriars station this was 36%. "In London, the most populous region also with the highest population density, more rail journeys were made in 2016-17 than all other regions of Great Britain combined," said the Department for Transport. "Between 2006-07 and 2016-17, the West Midlands, North West and West Yorkshire saw the fastest growth in rail usage. "These regional differences tend to reflect the levels of urbanisation within them. Areas with higher urban population densities are less reliant on car usage and more reliant on public transport, walking and cycling." Rail traffic in Scotland is concentrated around Glasgow and Edinburgh, and all of the country's 10 busiest trains are services to or from these cities. Trains chaos: What's really going on?